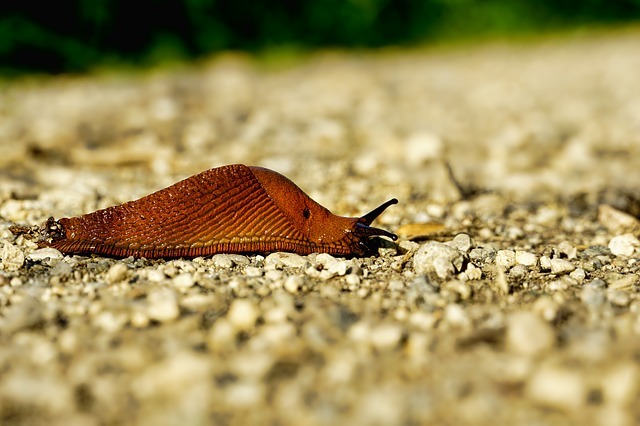 Running programs over the network is likely to result in network bottlenecks. Other causes of high network activity are, roaming profiles, file copying or large print jobs. 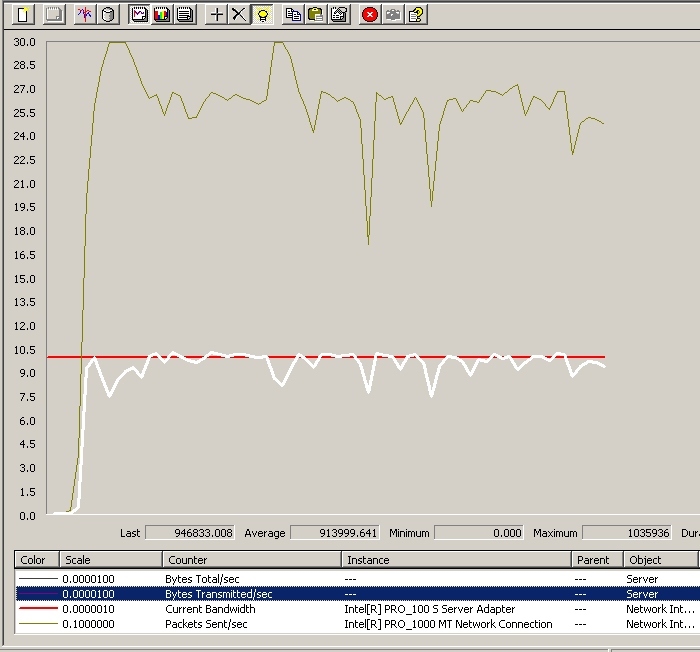 Use performance monitor to create a log and calculate the network utilization. This network example assumes that your hardware is working properly. There are several cautionary tales with the performance monitor chart below. Let me see if I can convince you that the maths prove a network bottleneck. The Bytes / Sec average 913,999. Beware, System Monitor never uses thousand separators which make the figures awkward to read. I have often revisited the data because I was out by a factor of ten. For example, at a glance you could mis-read 913999 as approximately 91,399 or even 9,1399,999. You may think that just comparing the red line (Current Bandwidth) with the white line (Bytes /Sec) proves that the network is at full capacity. On closer inspection of the Scale, you realize that the red line is 10x bigger than the white line. Now you may revise you estimate and believe that the network is only running at 10% of capacity. However, there is one more factor, the red line is in bits while the white line is in bytes. 1 bytes = 8 bits. When you compute all these factors, the network is actually running at 73%. White Line Bytes /Sec = 7,311,992 bits. 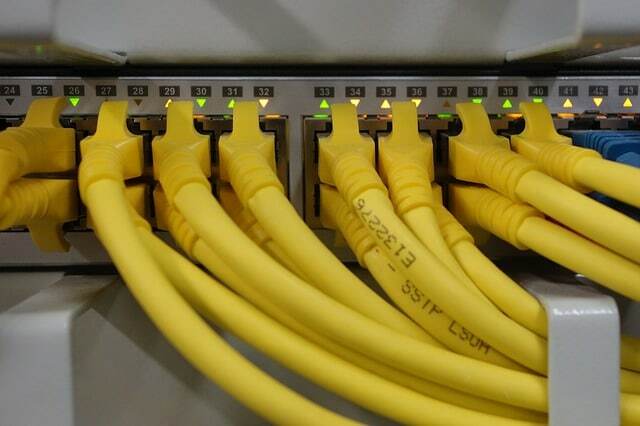 One of the amazing features of the original ethernet network is that only one machine can transmit at a time. Once the network reaches 30% capacity, pure chance means that two machines try and send a packet at the same instant. The result is more and more collisions start happening, this leads to re-transmissions and a slow down of network traffic. 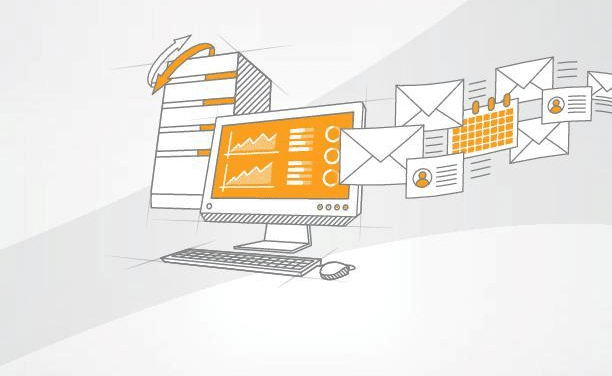 Networks bottlenecks occur at surprisingly low levels of utilization. 40% would normally be considered a bottleneck, and the only reason that I got a higher value was that there are only three machines on my test network. The more machines the greater the risk of collisions from two machines wanting to transmit at once. b) Faster network cards replacing the old 10MB cards. The problem is that it seems to have been discontinued in Windows 2000 onwards. Several respected sites claim you can install Network Segment via the Network Monitor, or Protocol Driver. For what its worth I have tried numerous techniques of getting the counter to appear in performance monitor without success – I agree with Microsoft Network Segment is no longer available. In Windows 2000, installing Network Monitor does not add the Network Segment object in System Monitor as in Microsoft Windows NT. To increase the stability and reliability of the Windows Management Instrumentation (WMI) interface, this object has been removed from System Monitor in the Performance tool in Windows 2000. Microsoft Network Monitor v3.2 is a tool which captures TCP/IP frames and displays their source and destination addresses along with detailed information stored in the datagram header. 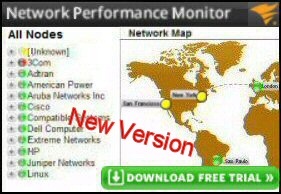 Network Monitor 3.2 works on all modern Windows operating systems, such as Server 2008, Vista, Windows Server 2003 and XP. Whilst it is easy enough to understanding the twin principles of capturing network traffic and displaying information, getting this tool to work can be frustrating for a beginner. It reminds me of learning to windsurf, at first it seems impossible that I could stand up on that board, never mind manoeuvre the sails. Most of the problems learning to use Network Monitor stem from being swamped by the sheer volume of data that this utility collects. The best way to start your voyage is to focus on the filters. What really helps is if you have a clear purpose for each journey with Netmon, that way you don’t get side-tracked by irrelevant menus. Moreover, each successive journey will be easier because you can navigate by familiar landmarks. Let us imagine that DNS is not working. If you capture the appropriate frames with the Network Monitor, you may discover from the destination address that your machine is trying to connect to a non-existent DNS server. Each packet has date / time information, thus you can measure response times for conversations between your computer and various servers. If necessary you could instigate a conversation with ping. A significant number of re-transmissions could indicate an intermittent connection problem. Broadcast traffic is an old enemy of network managers. 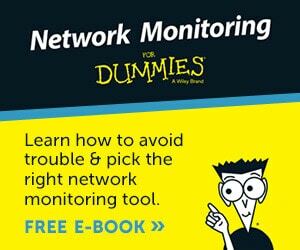 You could use seeking broadcast or multicast traffic as an opportunity learn more about Network Monitor, while you check for a well-known network problem. Check that the NIC and cable are good. Segmentation – change your subnet mask, add routers. Switches – install a packet switch. 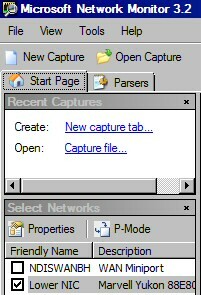 If you must have more than one protocol, check the bindings order in the network icon.